Snowboard Addiction provide a whole load of instructional snowboard lessons. This is part 2 of the Freestyle Lessons review. Part 1 provided an introduction to the content included in the course, which is extensive, along with some initial impressions of the material. In part 2, I’ll comment on some of the stand-out bits of instruction, my favourite sections, who I think will benefit from the lessons and what my overall opinion is. Note: if you visit the Snowboard Addiction site, be sure to use the code “afterbang” for a 10% discount on any of their products. The key thing that sets these lessons apart from others is the detail the instructor provides when explaining tricks, and the way in which the information is presented. Crystal clear instruction, all the bases covered, plus practical steps to improve. Here are some of the things done really well. Rotation vs. Counter-Rotation. The difference between the two is fully explained and remains a continual theme throughout all of the lessons, helping you to better understand both jibbing tricks and jumps. If this concept is new to you, try reading this post and then check out the Snowboard Addiction lessons: your feestyle will improve straight away. Spotting your landing. There’s good attention given to this, very useful for backside 180s, frontside 360s and dropping off rails/boxes. Where to look and when. Setup for kickers. There’s a lot of practical guidance given to setting up for kickers: speed, setup-turn, edges, platform for take-off, wind-up and pop. These concepts are applied from beginner to advanced jumps, helping from straight airs through to 7s and 9s. Jibbing basics. Great practical steps to take you from 50-50 to boardslides. Advanced jibbing. Good explanation of change-ups, showing different combinations, both with rotation and counter-rotation. 16 types of 180! Regular, switch, toes, heels, rotation and counter-rotation. The foundations for many tricks to come. Intro to buttering. Excellent for people new to buttering, showing correct body position aswell as excercises to improve your technique and become comfortable with basic butters. The balance rail. Simple idea, easy to build, and effective. I’ve made one and can feel the benefit already. 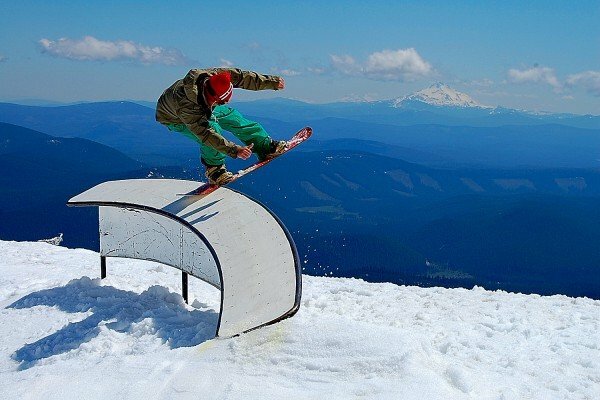 Jibbing: frontside boardslides. I’ve always struggled with these, and without knowing it, have found frontside boards easier using rotation. Add in the balance rail, stop looking down and I’m on my way. I also really like the change-ups and 180s in/out for boxes and rails. The intermediate jumping lesson has good guidance for shiftys and grabs; especially interesting to me are the nose and tail grabs. I haven’t tried those techniques yet (nose/tail), but having never managed to make a nose grab, I’ve now got something concrete to try. Shiftys into 180s have also really impressed me; before these lessons I’ve never understood how to do them, and it’s the same principal for tapping/bonking something and then spinning out the other way. Now I know how to work on these. Who Will Benefit From These Lessons? If you’re new to freestyle I absolutely think you will benefit. 100%. These videos start with the basics and fundamentals then work upwards. They’ll set you on the right path with loads of practical tips and useful insight straight away. You can be confident that the lessons will cover your progression for a long time! If you’re comfortably stomping 5s and 7s, and riding rails is second nature to you, you may not need this freestyle course. I’m not saying that you wouldn’t (a) enjoy them and/or (b) get some practial use from them, as they do contain advanced tricks; they’re just not as essential. You’re probably progressing with strong peers. Less than this and I’d say yes, the lessons will be extremely useful. There are plenty of advanced freestyle techniques covered and you will benefit. Even if you can spin 3s for example, the techniques covered will help you progress to 5s and 7s, and/or take you current jumping to bigger kickers. If it helps, consider my level. I’m not a beginner to freestyle but I don’t have a huge bag of tricks either. There are some example of my riding in Laax, Fernie and Morzine on this site. When I watched these videos I was instantly impressed. I learned new concepts, had things explained in a ways I hadn’t previously thought about and was motivated to progress my freestyle. I’m stoked to have these videos, they’re great for me and I’ll continue to use them. They provide by far, the best freestyle intruction that I’ve encountered. I can’t recommend them highly enough. Format: What Have I Got? I have the freestyle lessons in download format; it was easy to get them soon and I wanted to put them on my laptop and iPhone. Since then I’ve joined the Subscription Update Program – they give you all of their new material as it comes out. So far there’s been an introduction to buttering and a board setup guide. As mentioned above, the buttering intro was very good; I’m looking forward to the advanced flat-land tricks, and I think there may be an off-piste lesson coming along, which sounds great. Should You Rent or Buy Your Snowboarding Equipment?